I recently placed an order at Neiman Marcus to take advantage of the sale and free shipping. Seriously, who can pass up free shipping? It's a great incentive for finally ordering the item you've been eyeing on the site, especially if the site doesn't normally offer free or flat rate shipping. (I'd be ordering so much more stuff off Girlshop if they didn't charge an arm and a leg for shipping.) I bought a pair of Burberry rainboots, for some gloomy weather cheer, but somehow, I can't seem to make up my mind whether or not I want to keep them. They fit wonderfully! 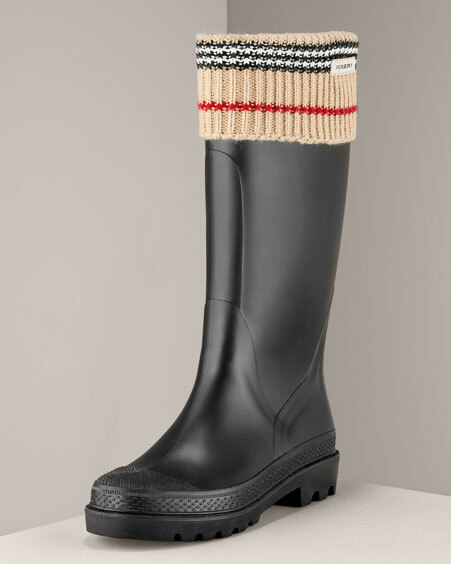 I've been wanting to get some black rainboots, and I adore the knit cuff... but the height of the boots are just... strange. The polka dot wellies I have are from Tamara Henriques, and they go up to my knees. The tops are wider, making my legs look thin in comparison. These Burberry boots come up to the base of my calf... and the beige (close to skin-colored) knit cuff makes my legs look, well, porky! Oink oink.. I don't know. are the insides of the boots rubber?